In this really suggestive VIS image, taken by the NASA - Mars Odyssey Orbiter on July, 24th, 2002, and during its 2.694th orbit around the Red Planet, we can see a small portion - showing something like a "Darg-Gray Flow" of unknown origin, running from the East/South-East to the West/North-West - of the extremely ancient and dark-colored Region (as seen from both Earth-based telescopes as well as through the cameras of all the Unmanned Robotic Satellites which orbited and are still orbiting the Planet) known as Syrtis Major Planum. Only a few and small to medium-sized Impact Craters can be seen on the area which is now been shown. Syrtis Major Planum - when observed through a telescope - looks like a "Dark Spot" (---> Albedo Feature) located at the Boundary between the Northern Lowlands and Southern Highlands of Mars, just West of the large Impact Basin known as Isidis Planitia. In fact, Syrtis Major Planum was discovered, on the base of data collected by the NASA - Mars Global Surveyor Orbiter, to be a low-relief Shield Volcano, when it was formerly believed to be just a Plain (and it was then known as Syrtis Major Planitia). The very dark color of its Surface comes - most likely - from the Basaltic Volcanic Rocks that form (---> are found all over) the Region and a corresponding (and relative) lack of the Red/Orange Dust that covers most of the Red Planet. 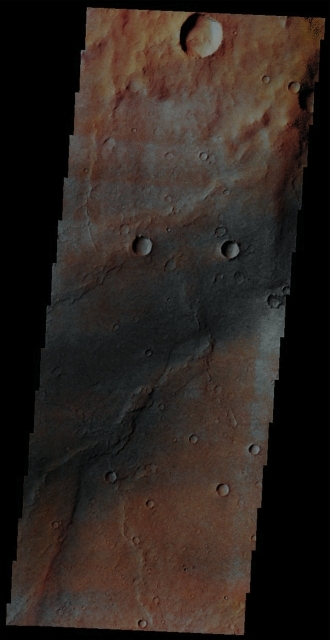 This image (which is an Original Mars Odyssey Orbiter false colors and Map-Projected frame published on the NASA - Planetary Photojournal with the ID n. PIA 19009) has been additionally processed, magnified to aid the visibility of the details, contrast enhanced and sharpened, Gamma corrected and then re-colorized in Absolute Natural Colors (such as the colors that a normal human eye would actually perceive if someone were onboard the NASA - Mars Odyssey Orbiter and then looked down, towards the Surface of Mars), by using an original technique created - and, in time, dramatically improved - by the Lunar Explorer Italia Team.